In Lesson 2 "Sync over Async", you'll examine where sync over async can creep into an application, and learn how to remove to ensure you don't suffer from its effects. In Lesson 3 you'll explore the perils of async void methods, an issue at the heart of the C# compiler team. 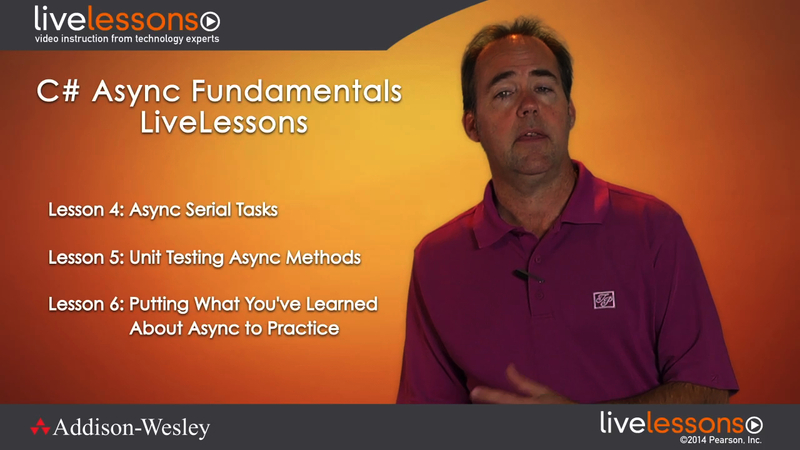 In Lesson 4 he'll get you up-to-speed on techniques to ensure that you avoid forcing async methods to run serially. In Lesson 5 you'll learn techniques for unit testing async methods. Bill Wagner has spent his entire career in the software industry, spanning both technical and business roles. Bill's technical time is spent between curly braces, primarily with C#. He's the author of the bestselling "Effective C#", now in its second edition, and "More Effective C#". His articles have appeared in MSDN Magazine, the C# Developer Center, Visual C++ Developer's Journal, Visual Studio Magazine, ASP.NET ,Pro, .NET Developer's Journal and more. He's written hundreds of technical articles and actively blogs on technical and business topics. Bill is also a Microsoft Regional Director. He spent eight years as a self-employed consultant before co-founding SRT Solutions with Dianne Marsh. Over the past decade, SRT Solutions has grown into a premier software development company, amassing 4 FastTrack awards (2011, 2010, 2008, 2007), the Michigan 50 Companies to Watch award (2011), and making the Inc 500/5000 list (2011 and 2012). Bill was also awarded Automation Alley's Emerging Technology Leader award in 2011.After a successful exit from SRT Solutions, Bill now spends his time helping developers improve their skills. 3.1 Did my task finish?